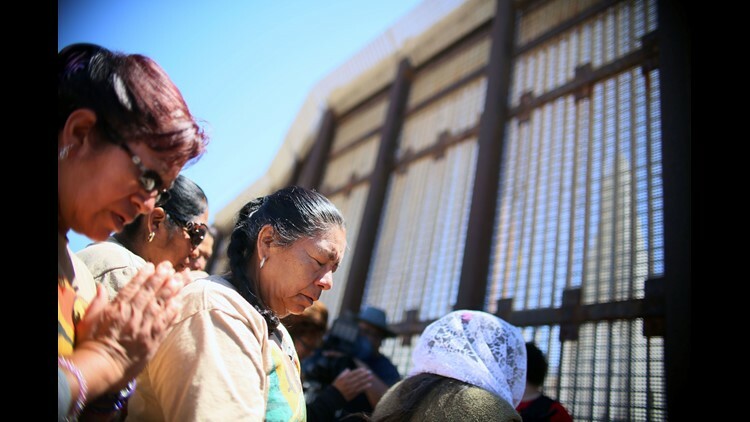 Worshipers engage in a bi-national Easter mass along the US-Mexico border fence at Friendship Park in San Ysidro, Calif.
As many as 1,000 migrant families separated by the Trump administration under its "zero tolerance" immigration enforcement policy will get a second chance to apply for asylum under an agreement brokered between the Department of Justice and lawyers representing those families. The agreement, submitted in federal court late Wednesday, will halt deportation proceedings to give another opportunity to parents who failed the first stage of the asylum application process, where they must demonstrate they have a "credible fear" of returning to their home country. "The Trump administration will never be able to erase the full damage of its family separation policy, but this agreement is an important step toward restoring and protecting the asylum rights of impacted children and parents going forward," said Lee Gelernt, an ACLU attorney who has been leading the team of lawyers representing the families. Lawyers for the parents have argued that they were not able to properly present their cases because they were separated from their children at the time of their interviews, a traumatic experience that made it difficult to explain the situation in their home countries. Under the agreement, federal immigration officials will be required to consider the "psychological state of the parent at the time of the initial interview." Lawyers for the parents have also argued that parents were rushed through the asylum process by federal immigration officials, were not informed of all their legal options and were occasionally coerced into signing away their right to apply for asylum. Under the agreement, the government must allow a lawyer to represent the parents during their second interview, either in person or on the phone. If either the parent or child passes the initial credible fear interview, families will be allowed to continue the asylum process together. In cases where the parent is turned down, they will be allowed to remain in the U.S. until the conclusion of their child's asylum case. The agreement provides a small window for the roughly 400 parents who have already been deported to return to the U.S. to make new asylum claims. But those cases will be "rare and unusual" and will require case-by-case reviews by the federal judge overseeing the case. "The government does not intend to, nor does it agree to, return any removed parent to the United States or to facilitate any return of such removed parents," the agreement read. Gelernt said the agreement at least leaves open that possibility. The agreement does, however, allow all deported parents to testify on behalf of their children in the U.S. by phone and provide documents from their home countries to prove the hardships the child would face. The plan, which was filed by lawyers on both sides late Wednesday, must be approved by U.S. District Judge Dana Sabraw, who ordered the administration to reunite all separated families and continues overseeing the reunification process. Sabraw is scheduled to hold the next hearing on the case on Friday in his San Diego courtroom. The new process comes as the government has struggled to finalize all family reunificaitons ordered by Sabraw in June. Of the 2,654 children who were separated, 2,181 no longer are in government custody, either reunited with their parents or placed with other sponsors. Another 57 remain in custody because the government alleges they were not separated from their parents. That leaves the 416 whose parents are either deported, in jail on separate criminal charges or facing further scrutiny because the government is concerned they may pose a danger to the child.